Elizabeth Hurley looks gorgeous on the Indian sari outfit. 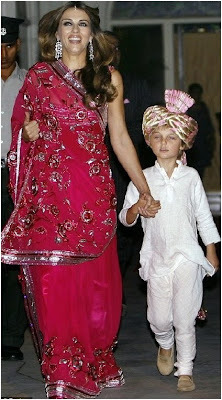 After dating then marrying the Indian businessman Arun Nayar in 2007, Liz Hurley often wears Sari on many occasions. Arun first wife is a part time model from Milan Valentina Pedroni and they’re married for eight years. Liz also has a long love story with Hugh Grant for 10 years, then have baby Damian with Stephen Bing a film producer. Elizabeth Hurley attended a Breast Cancer Awareness campaign in Mumbai with her son, Damian. Both of them wore the Indian traditional dress. Liz wore an elegant Fuchsia embroidered sari while her son wore kurta and gold turban. This Elizabet Hurley’s sari was shocking because she showed her breasts on Love Ball at the Roundhouse London. Liz didn’t wore a Choli or Ravika underneath, so her top looked transparent. Elizabet Hurley looked sweet on pink sari when she attended Breast Cancer Research Foundation’s Hottest Pink Party Ever. No one denied the beauty of Indian Sari. Here, Elizabeth Hurley made this outfit looked more luxurious. This grey silver sari was embellished in lots of shiny sequins.